Hunt for Wolverine: Does Anyone Care? Logan (the ‘continuity’ Logan?) is FINALLY back, but in what capacity? He first re-appeared in Legacy #1 and had possession of the space infinity gem. Fast forward a couple months to Infinity Countdown Prime #1 and we witness Logan interact with Ultron bots and Loki. The only new information from this interaction is, um, nothing. We learn it’s, in fact, the ‘real’ Logan and that he intends on keeping the space gem even though Loki warns him if he’s not careful the whole universe could be re-written again? No, we certainly don’t want that… or do we? We’ve had a soft reboot and that leaves fans wondering what is going on with the Marvel universe. 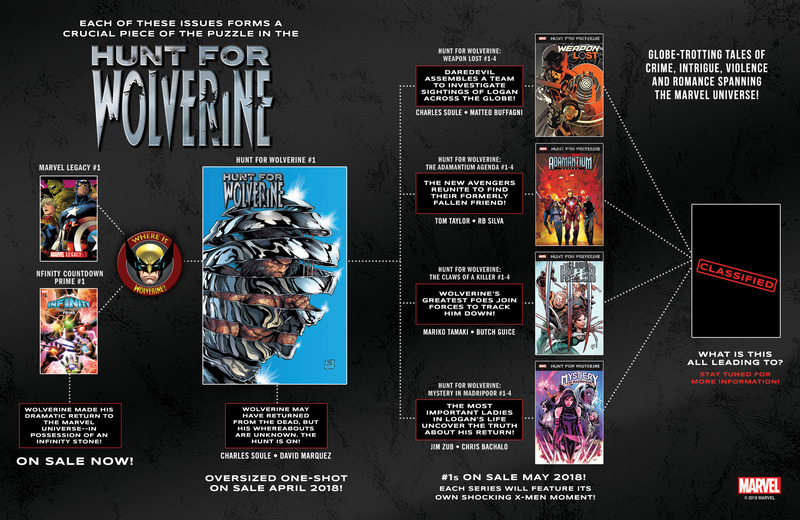 The one thing I do look forward to is Charles Soule’s handling of the return of Wolverine. Charles was responsible for the Death of Wolverine and it was handled really well. It was a 4-issue limited series with incredible art by Steve McNiven. This time around, Charles and David Marquez are delivering a over-sized, 1-shot issue followed by four, 4-issue limited series (see the matrix below). This all leads up to something ‘classified’. I’ll probably check out Weapon lost (written by Charles Soule) and Adamantium Agenda (Tom ‘All-New Wolverine’ Taylor & R.B. Silva) because of the writers and characters involved, but plan on skipping the other two titles. I do hope they make it so you DON’T have to read all four titles to understand what is going on with the story line. Marvel normally does a good job making them independent enough, but that doesn’t stop the completest from feeling the need to read every ancillary book in a story arc. Podcast #2 review Xerxes, Isola & Gideon Falls! Death or Glory #1 Khoi Pham Sneak Peek, Store Variant!